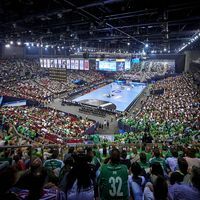 The Women's EHF FINAL4, the showpiece event and final weekend of the Women's EHF Champions League, will stay in Budapest for another three years, bringing top European women's handball to Hungary's capital until 2019. EHF Marketing and the Hungarian Handball Federation have agreed to prolong the existing cooperation and the contract between the two parties will be signed in the coming days. “Budapest has been a great host city and the Hungarian Handball Federation has been a reliable partner for the past three years. I’m very happy that we prolong our existing cooperation and look forward to further developing the Women’s EHF FINAL4, which includes the implementation of a title sponsor, together with the HHF,” says David Szlezak, the EHF Marketing Managing Director. It was confirmed that the 2017 edition will take place on 6/7 May in the Papp László Budapest Sportaréna. The arena, which seats up to 12,000 spectators for handball events, will also be the venue of choice in 2018 and 2019. The first Women's EHF FINAL4 took place in Budapest in 2014 and was won by Györi Audi ETO KC. The 2015 edition was won by Montenegrin side Buducnost; in 2016 CSM Bucuresti topped the podium. The new season of the Women's EHF Champions League starts in just about two weeks with the first group matches being played from 14 to 16 October.